One of Gwyn's Four Knights, Sir Artorias is a holy warrior with an unbendable will of steel and unmatched skill with a greatsword. His personal symbol is a wolf, as depicted in his ring, and he later gains a wolf companion named Sif. He makes his formal appearance in the Additional Content. Artorias was present during the fall of New Londo. The home of the Darkwraiths, the Abyss, can only be traversed by the creatures of the Dark. To be able to destroy it from the inside, Artorias made a covenant with the creatures of the Abyss, symbolized by a ring. But in doing so, his greatsword became cursed. In recognition of his actions in the New Londo crisis, he gains the moniker "The Abysswalker" and awarded one of Anor Londo's treasures, a blessed pendant that allowed him to repel the Dark of the Abyss. When Oolacile woke Manus, Manus' influence corrupted the citizens of Oolacile against their will and made them the forces of the Abyss. Artorias, accompanied by Sif, arrived there to save Oolacile as well as Princess Dusk, who was captured from the present day. However, the two were overrun by the creatures of the Abyss. Artorias sacrificed himself to protect Sif using his greatshield to raise a barrier around the wolf pup. Defeated by the Abyss, the knight became corrupted against his will. His already-cursed sword became corrupted by the Abyss as well. 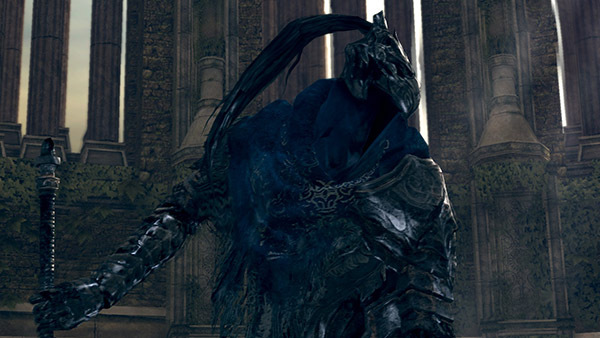 But even with one arm broken, Artorias is still a formidable swordsman (some of his technique is later used by Sif in Sif's boss fight), as you will find later when you fight him before entering Oolacile Township. His grave, marked with his greatsword, is placed at the Oolacile Sanctuary area (later known as the Darkroot Garden) and is guarded by Sif, Alvina's clan of Forest Hunters, and possibly also Lord's Blade Ciaran. Inside the huge stone building near where Marvellous Chester is. Performs a straight lunge with his greatsword. Roll towards him, but slightly to the right, towards his unarmed hand. Somersaults into the air and slams his sword down vertically. He can repeat this up to three times which can stunlock you. He only uses this when in close-to-mid range from you. This is one of the few attacks in the game that completely ignores iFrames, meaning that it will damage the player even mid-roll or on the ground if the sword connects with the player. Rolling to the side is the best way to avoid it. Crouches, then leaps into the air and will attempt to hit you. He uses this when the player is further away. This has an area of effect around him. Dodge or run towards him as soon as he jumps. Two circular slashes like Sif. However, it is faster and has a shorter radius. A jump slash like Sif. This is very powerful and happens almost immediately. This seems to be used exclusively when you stand behind him, most likely after dodging his big jump-attack. Throwing black sludge in an arc in front of him. The black sludge he leaves behind as he moves around will slowly deplete your health. They will disappear after a very short time. Can roll to dodge your attacks. With every fifth of his health depleted, he will roll away and surround himself with a dark aura, as he prepares to cast an explosion. Standing in this aura does not cause damage, but the explosion can deal a lot of damage. His casting can be interrupted with enough damage. After the explosion, his attacks will become stronger and deplete significantly more Stamina for about a minute. This effect can be stacked multiple times if he is allowed to power up repeatedly. Resistant to magic, fire, and lightning. Dodge or keep distance from his attacks, blocking takes up too much stamina, which is important for this fight. [Note: If you use a decent stability shield with Strong Magic Shield, you will lose no stamina from most of his attacks, while the buff is active] To get a better hold on the timing needed, the Stone Guardians that litter the area are good practice. His long ranged jump slash is very easily avoided— dodge and counter-attack or heal. When he changes from walking to running, he will commence attacking. Use the walking time to regen stamina and raise your guard appropriately. Both the jumping overhead slash and the ranged jump slash have a small time interval where you can dodge. While this boss is really difficult to predict, he does have a few tells for his attacks and a quick roll is very important. Place yourself away from him by about twice his reach at all times (even for melee). When he uses his Somersault slam attack you will want to roll to the right as the camera tilts upward while locked onto him. You want to do this three times and then get in 1 or 2 attacks (based on your weapon) after the third attack lands. Avoid attacking after his Steadfast Leap. Instead use that opportunity to heal or get some distance from him. When he uses his Overhand Smash, roll to the right. While he leaves himself open for a frames, he will usually follow up with his Spinning Slash attack. Therefore it is best to get some distance from him instead as the Spinning Slash attack is difficult to get away from when it begins. With his Charging Slash move you will always want to roll backwards from where he intends to land the attack. After successfully dodging this attack, you will be able to get 1 or 2 hits on him. His Heavy Thrust attack will need to be side dodged. Depending on which way he turns during the charge, you will need to dodge the opposite way. After you dodge he has a long recovery time and you should be able to get 2 or 3 hits in. When you are behind Artorias he may use his Abyss Sludge attack. This move does little damage but can stun you. If timed right, you can roll forward through the attack and get a hit on him then immediately retreat. 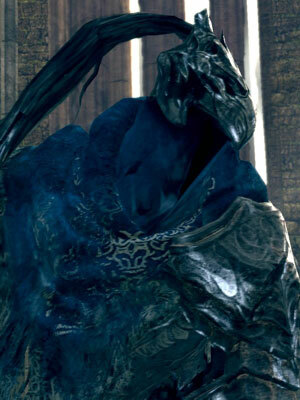 After Artorias has lost 1/3 of his health he will start to use his Wrath of the Abyss power up. If left alone, he will do much more damage after he completes the power up for a limited time, potentially one shotting you. If you can get close fast enough, you can stun him out of his power up before it's completed by hitting him repeatedly. If you don't do enough damage fast enough then he will hit you with an AOE blast attack that will knock you on your back. Your best bet is to use a heavy, high damage, weapon and stop him from gaining his attack buff. Equip armour with decent poise (50+ is good), a mid shield with 100% physical and a decent weapon (sweeping swords such as the Black Knight Sword are good as he moves around quite a bit and can be hard to hit with a thrusting weapon). Most importantly, patience, patience is key! Keep your shield up when he is standing near you, only lowering it to recharge Stamina. Right after he performs any of his basic attacks, hit him once, then shield back up. If he tries any of his aerial attacks, roll just before he hits you and attack him once. If he starts performing his aura blast, use that opportunity to get back a safe distance and restore stamina and/or heal. If you're close enough, rush and hit him 2-3 times to interrupt the power-up and score damage. Be careful after his aura blast. His attacks do more damage (and chew up your Stamina) for a while, so do not let your guard down. Thrusting weapons like the Silver Knight Spear are perfect for this fight, especially for Dex builds. If you attack at the appropriate times he generally won't dodge. Keep your equip load below 50%. Warning the boss appears to have very high thrust defense. The Greatshields have high stability and will block most of his attacks with a minimum loss of stamina. You will still need to dodge his high leaping attack. Block his attacks and pick your spots to strike afterwards. A spear or halberd is a good choice due to their range and quick poking movement. Before you strike be sure the attack won't deplete so much stamina that you'd be unable block the next hit if Artorias attacks again quickly. If you are a lower level and unable to find a means of staggering during Artorias' charge-up, you can place a headshot and force him out of his animation using a bow. At lower levels this can make the difference between life and death; his attacks become too powerful to block for the next 60 seconds if he succeeds. If the aura surrounds him from failing to stop the charge-up, you may simply want to wait and dodge his attacks until it goes away. Beware that he will soon enter the animation again, so be ready with your bow. If you succeed in hitting him in the head, he will stand up and continue the fight. To help time this tricky attack, watch for Artorias to roll backwards twice, as this is the only time that he will do it before attempting to charge up; use this time to arm and aim your shot. The power of the bow and arrow need not be high. It is possible to channel a Lightning/Great Lightning or Sunlight Spear after his long range jump attack. For this it is recomended to keep your distance, for him to perform this attack and wear Miracle boosting items. Wrath of the Gods is a possibility to finish him off, which can be channeled after his long range slide attack too. Artorias' own sword and shield are fairly effective against him, should you get your hands on two Souls of Sif to make the weapons. Since the Greatshield of Artorias has such high stability, it enables you to simply sit there and block every strike he throws at you. Picking your opening is important, as the Greatsword of Artorias has a fairly slow swing, and a criminally slow heavy attack. Good openings to strike are after his slide (if it misses), after his standing vertical strikes (if they miss), after any standing combo (provided the final blow misses), and after his leaping blade plant, provided you get behind him mid-flight, but stay close enough to smack him in time. The fight will take quite some time, but you will hopefully only take one or two hits. Furthermore, almost all of the strike openings can also be used to drink a flask. This strategy only works with NG. A Dragon Greatsword+5 does 809 damage against Artorias with the 2H energy wave attack when Power Within is activated. This means someone would only need to get in 5 clean hits to defeat him since his HP is only 3,750. Within the game files there are a number of unused audio files which seem to be Artorias. They can be listened to here. A Sunlight Spear will stagger Artorias during his charge-up animation.